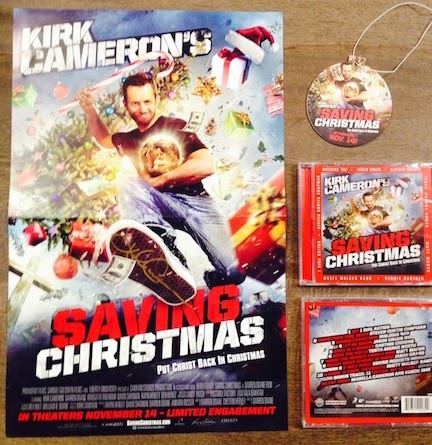 Kirk Cameron's Saving Christmas premiers on November 14th in select theaters. I had the rare opportunity to be able to preview it before it hit theaters. This Christmas, have your family join with Kirk Cameron’s family and dive headfirst into all the joy, dancing, celebration, feasting, imagination, and traditions that glorify the true “reason for the season.” KIRK CAMERON’S SAVING CHRISTMAS is an engaging story that provides a biblical basis for our time-honored traditions and celebrations, and the inspiration to stand strongly against a culture that wants to trivialize and eliminate the faith elements of this holy season. So take in the splendor; take in the majesty; take in the story. Take it all in… and let’s put Christ back in Christmas! 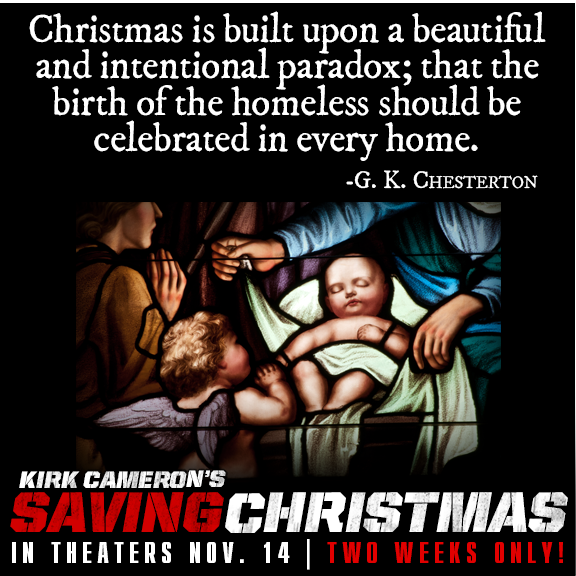 KIRK CAMERON’S SAVING CHRISTMAS is in theaters for a limited engagement beginning November 14 for two weeks only! And second, I will be hosting a giveaway where one of the readers of The Radar Report will win a Saving Christmas swag bag. This will include a SIGNED Kirk Cameron Saving Christmas poster, a car air freshener that is shaped like a Christmas ornament and smells like a pine tree, plus a CD of Christmas songs. Even though there was nothing new to me (but I am also much more versed in the Bible and Christian history than the average person.) I still very much appreciated and enjoyed this movie. Swaddling clothes. I remember asking about them when I was in my first Christmas pageant at Church. "Just something they used back then" (Yes, but what else is it used for?) What are frankincense and myrrh? As a child, I thought they were pretty lame gifts for a Baby. But as I have learned more, I understand why they were given. In 2006, I had the privilege of visiting Israel. One day of the trip, we began in Bethlehem at the Church of the Nativity. I was able to kneel at the spot where it is traditionally thought Jesus was born. That afternoon, in Jerusalem, I walked the streets of Jerusalem where some Christians walk each Friday to the Church of the Holy Sepulcher to commemorate the death of Christ. I visited Christ's traditional burial spot, and where some Christians believe He was buried in the same day. Christmas points towards Easter. The movie was an interesting concept. It begins and ends at a Christmas party, while the bulk of the movie is two men sitting in a vehicle, and as Christmas traditions are explained, the movie goes to that tradition. There was only one part of the movie I didn't enjoy -- the hip hop dance at the end. I felt it went on too long, and that it didn't really add to the movie -- I think any number of endings would have been just as good if not better. I am not having dancing at my wedding reception, and yes, I've caught some flak about that. I grew up in a church that taught dancing was wrong. I don't agree with that by this point, but also I'm not a big fan of dancing -- even hip hop. I was glad when that segment was over. Overall this was a great movie, one that I enjoyed. I would recommend it to any Christian to help them know about the meanings behind some of the symbols and traditions of Christmas. It will be in theaters on November 14 and will only run for two weeks, so if you want to see this movie, don't wait. One winner will be chosen from my blog to receive a prize pack of a Kirk Cameron signed movie poster, a Christmas CD, and a car air freshener that smells like a tree. U.S. and Canada only. Winner will have 48 hours to respond before another winner will be chosen. I learned that you can buy tickets online now. Darren Doane wrote, produced, directed and starred in this movie. I learned that by watching the trailer, I can't wait to go. I also looked it up and I live 3 miles from a theater showing it. Can't wait. I learned that it will only be in Select Theaters & only for 2 weeks. I learned that you can buy tickets online. I learned it is only in certain theaters and only for two weeks. I learned that it is in partnership with Liberty University. I I learned that I would have to travel a little to see this movie and it's only playing for 2 weeks. I learned That Saving Christmas is about putting Christ back in Christmas. Copyright 1991-2017. Simple theme. Powered by Blogger.